Have More Fun This Halloween! After months of lectures about avoiding sweets and coming in before dark, most kids look forward to Halloween all year. This is a time when they are allowed and even expected to wander around in the dark, dress up in strange outfits, and beg for sweets. Having good manners and following proper Halloween etiquette on this spooky night will make the evening quite a bit more fun. Whether you go trick or treating or to a Halloween costume party, you need to observe some basic rules of etiquette and good manners. For safety reasons, avoid going to a house that seems suspicious or makes you feel uncomfortable. It's not worth taking a chance just to get another piece of candy. Many cities and counties have policies for trick or treaters on Halloween, so you need to find out what they are before you leave the house. This may include start and end times, where you are allowed to go, and noise ordinances. Most of the time, these laws are very generous, and they are always for your protection. Your neighbors will appreciate knowing you are aware and observant of the laws. When selecting your costume, you need to consider several things. Although it’s okay to be scary, you still need to be mindful of who will see you. Kids from your seventh-grade math class might get a kick out of a slasher costume, but if you’ll be around tiny tots when they are likely to be out early in the evening, you’ll need to tone it down so they don’t have nightmares that can scar them for life. Make sure your costume is safe. You should be able to see everything around you. The hem of the outfit should never drag the ground, or you may trip and fall. If you are trick or treating after dark, wear a reflector and carry a flashlight so people in cars can see you. Always respect people’s property. Even though you may utter the words, “Trick or treat,” that doesn’t give you license to vandalize anyone’s house or lawn. What may seem harmless to you might pose a hardship on the person who has to clean it up the next day. If there is a sidewalk, choose that instead of the lawn. Not only will hundreds of feet trampling a path over grass wear it down to the dirt, there might be a hole or something sticking up out of the ground that you can’t see in the dark. You will also want to avoid walking through flowerbeds or special landscaped areas. If you do accidentally damage something, offer to fix it as soon as possible. The key is to treat other people's home and property as you would want them to treat yours. When someone gives you candy, you should offer a polite comment, such as, “Thank you.” You might be dressed up as a monster, but that doesn’t mean you should act like one. If the person handing out the candy asks about your costume, be nice and answer the question. Be grateful for whatever the person at the door hands you. Asking for something else is rude. You should also never grab for the candy bowl. If the person extends it to you to choose what you want, only take one piece of candy unless they offer more. Don’t visit any house more than one time. Many homes may be dark, so avoid going to their doors. The people who live there may have chosen not to hand out candy for any number of reasons. Maybe their religion doesn’t allow them to participate in trick-or-treating, or perhaps they have already run out of candy. Whatever the case, the best thing to do is just move on to the next house. You’ll get plenty of candy from those who enjoy Halloween, so there is no point in dwelling on those who don’t. 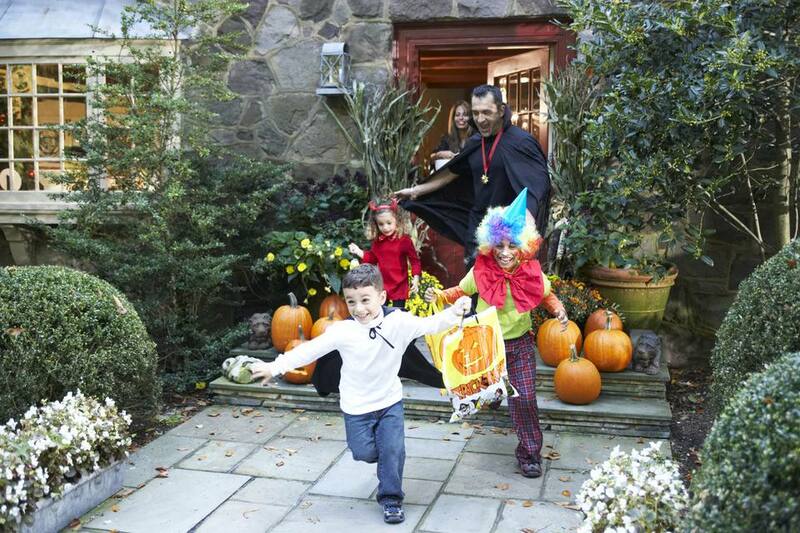 If you are too old to trick or treat, opt for a Halloween party instead. There are several schools of thought on how old is too old, but most people would agree that if you have a driver’s license, you should drive yourself to the store and buy your own candy. Leave the trick-or-treating to the younger set. If you long to walk from house to house, and you are a responsible teenager, perhaps you can give some parents a break and take their little ones trick-or-treating. If you do this, make sure you keep a close eye on them.